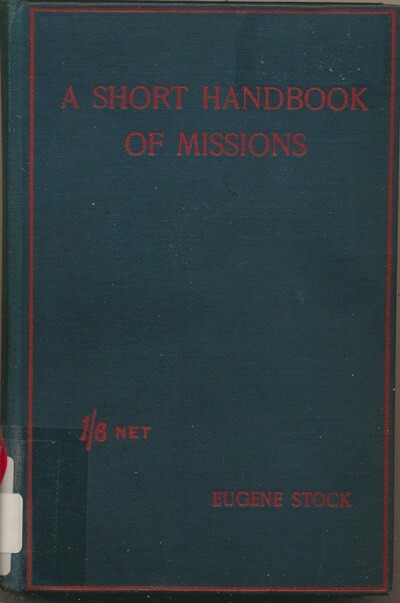 Eugene Stock, who also wrote the massive 4-volume History of the Church Missionary Society, provides a brief – but nonetheless comprehensive – introduction to Christian missions. My thanks to the Cambridge Centre of Christianity Worldwide for providing a copy of this public domain title for digitisation. The last few years have seen a great change in the attitude of the Christian public towards what are called Foreign Missions. There was in the past a great deal of earnest sympathy with them, and liberal support of them, although in comparatively limited circles; but the principles and methods, the history and environment, of Missions, were not systematically studied. It is in this respect that the change is apparent. Old missionaries on their forty or fifth or sixth furloughs say that, as they go about the country to preach and speak in behalf of the cause, they find an intelligent knowledge and appreciation of the work which is new. It is partly a cause and partly a result of this increase of knowledge that missionary books of all kinds are multiplying, and find a ready sale. This little book presents a short series of Bible studies about what the minor prophets have to say about Christian Missions. The author was the Principal of St Aidan’s Theological College in Birkenhead. Although the Wikipedia article does not mention it, most of the library from St Aidan’s was merged with the library of Liverpool Cathedral in 1970. I know this because when I worked in Liverpool Cathedral I spent many happy lunch hours browsing through them. My thanks to the Church Mission Society for their permission to place this book on-line. The purpose of this little book is a simple one; it is to help the student of the Bible and the student of Missions. The Christian who realizes the full blessing of the Gospel is both of these. But he sometimes thinks that the two studies are distinct, that they must be kept separate; it is a mistake, and sometimes a costly one. We can study the principles of the Kingdom of God in the Bible; we can watch the development of these principles in the mission-field; we can ponder God’s dealing with men in centuries long past; we can see Him deal with men in the same all-wise, all-loving way in the Uganda or China of to-day. And the double study confirms our faith, excites our earnest service, in a way which can be done by neither study alone. We are apt to forget that the God Who by His Spirit made the story of the Church of Antioch a wonderful story indeed is the same God Who to-day writes for us the wonderful story of Uganda…. 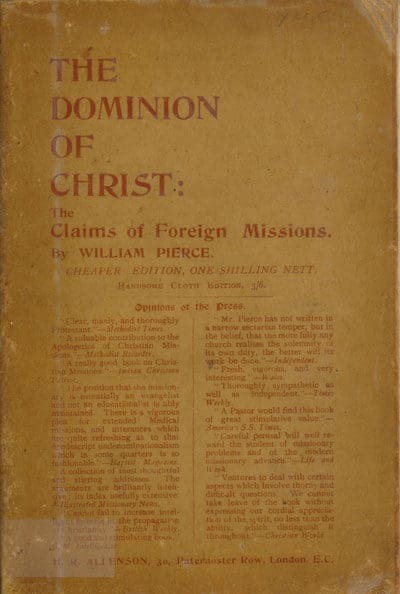 These three lectures were given at Church House Westminster by Henry Hutchinson Montgomery, formerly Bishop of Tasmania, He considered the first of three to be the most necessary for his day, as it is always “…most necessary to affirm and reaffirm the foundation principles of our Faith, upon which the Mission work of the church wholly rests” [p.iv]. My thanks to the Cambridge Centre for Christianity Worldwide for providing a copy of this book for digitisation. This title is in the public domain. In a course of Lectures on the Missionary problem, the first must needs be devoted to the fundamental questions-to our principles, our position, and our attitude to all other faiths. 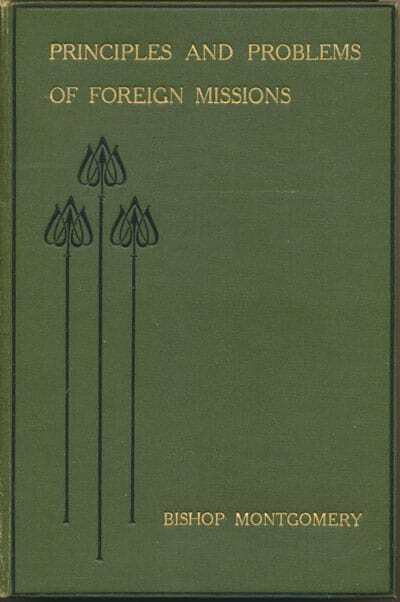 This book of Missionary Theology is an expanded version of a paper originally presented at a Missionary Conference at High Leigh, Hoddesdon, Hertfordshire in January 1924. The author hoped that it would help to rectify the shortage of contemporary books on that subject. My thanks to the Cambridge Centre of Christianity Worldwide for providing a copy of this book for digitisation. This title is in the public domain. William Pierce [1853-1928] offers some encouraging observations on missions on the occasion of the Centenary of the London Missionary Society. My thanks to Redcliffe College for providing a copy of the book for scanning. This title is in the public domain. William Paton [1886-1943] sets out the argument for world mission. It is based on the material presented at the Jerusalem meeting of the International Missionary Council (March 24th – April 8th 1928). My thanks to Redcliffe College for providing a copy of the book to scan. This title is in the public domain. The purpose of this book may be briefly stated. It is to set out the main elements of the case for the Christian world mission, and to show some of the principal tasks which are bound up with that mission. The book owes everything to the Jerusalem meeting of the International Missionary Council, and could not have been written without it, but it is not directly concerned with that meeting. It seeks, rather, to draw attention to some of the principles which must be accepted and to some of the necessities which must be met if the generous enthusiasms stirred up by the Jerusalem meeting are to bear fruit…. This is a series of public lectures on missions by one of the 19th Centuries most enthusiastic proponents of the Enterprise. My thanks to Redcliffe College for providing me with a copy of this book to scan. This title is in the Public Domain. In introducing to the Christian public this volume of Lectures on Missions, delivered before the Theological Seminary of the Reformed Church in America, at New Brunswick, N. J ., it is proper that a brief account should be given of the origin of the lectureship. On the r6th day of April, 1888, Mr. Nathan F. Graves, an Elder in the Reformed Church of Syracuse, N. Y., and an active member of the Board of Foreign Missions of the Reformed Church in America, addressed the following letter to the Rev. Prof. Mabon, of the Theological Seminary: no special instruction to fit them for their important work. “I write to enquire if the subject has ever been considered in the Seminary; and if you consider it desirable and practicable to establish such a professorship, I will be greatly obliged for a reply at your convenience. Walter Elwell notes that Arthur T. Pierson [1837-1911] was “[h]ailed as the greatest populizer of missions of his age and one who revolutionised missionary literature…” [Evangelical Dictionary fo World Missions, p.756]. In this volume he summarises the history of missions, outlines the problems facing the missionary enterprise in the 1880s and suggests a solution. My thanks to Redcliffe College for providing me with a copy of the book to scan. This title is in the Public Domain. If in this little book any good is found, it is, like most good things, -a growth; it has come by a process of development in personal study and pastoral service. 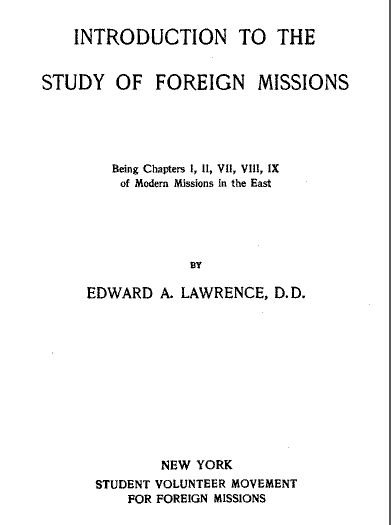 Edward A. Lawrence’s Introduction to the Study of Foreign Missions consists of 5 chapters extracted from his larger work on the subject, Modern Missions in the East (1895). This book is in the Public Domain. 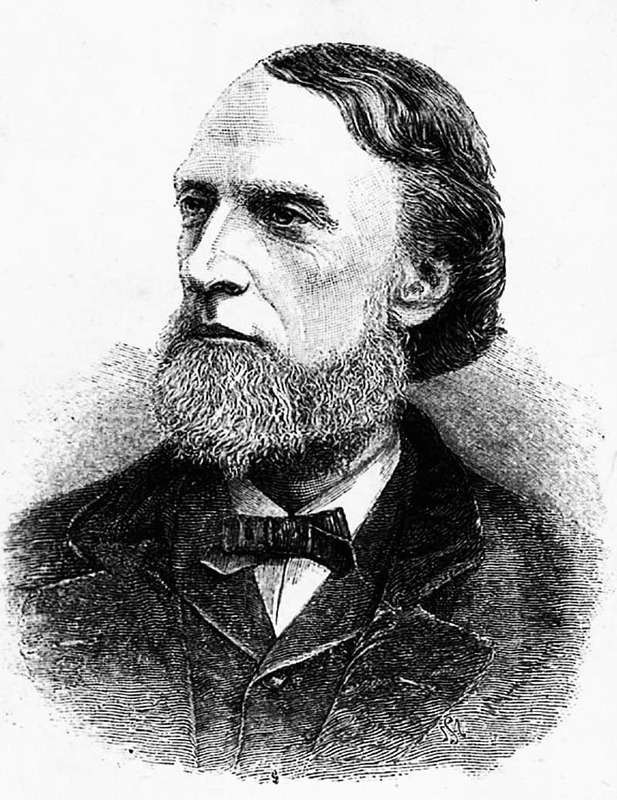 Samuel Zwemer’s main contribution to Christian missions, according to Ruth Tucker, “was that of stirring Christians to the need for evangelism among Muslims. 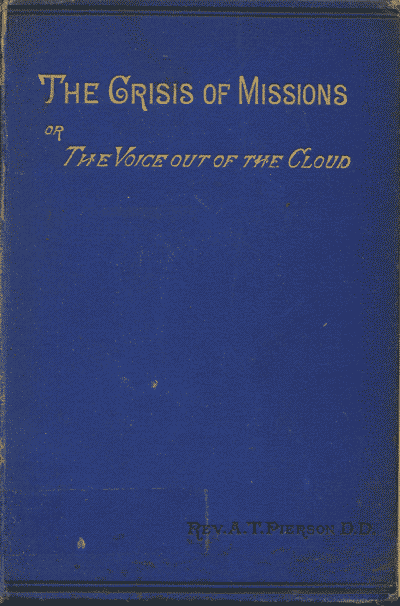 This short book contains seven of his addresses in which he attempts to demonstrate that “the Old Gospel is the True Gospel”. 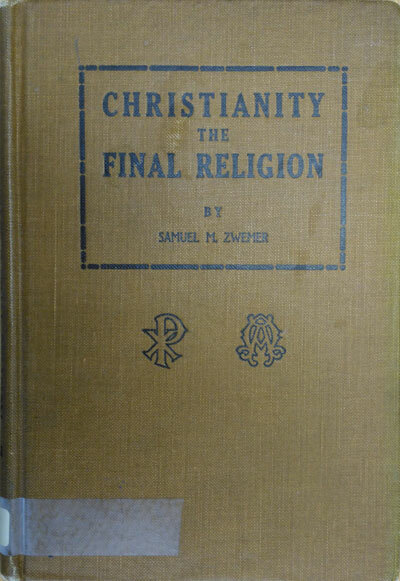 Samuel M. Zwemer [1867-1952], Christianity the Final Religion. Addresses on the Missionary Message for the World today, showing that the Old Gospel is the Only Gospel. Grand Rapids: Eerdmans, 1920. Hbk. pp.109. Click to Download in PDF. The Wikipedia article on Samuel Zwemer referenced above does not list this book is its bibliography – perhaps someone could add it and the link to the on-line version here. 5 – What Is the Apostolic Gospel? Fanatics have been defined as those who redouble their energies when they have forgotten their aim. Doubtless all who are interested in the missionary enterprise are in these days putting forth new energy and advocating more rapid movement to attain their object. Have not some, however, forgotten the goal in their earnest effort to press forward? Is there not some danger lest we run so fast that we forget to carry the message? Will the broader outlook diminish deep insight?